Considering all that is wrong – in the mind of the World, amongst the people in the Church, within ourselves – this is a really heartwarming article. Thank you! 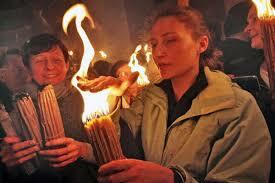 Having heard of the miraculous event of the Holy Fire, I thank you for the opportunity to finally look a bit further. Before I even got past the first paragraph though, I was amazed that the Holy Fire was transported to homes ‘in far countries’. I’m visualizing transporting that flame…out the Church…in the car…to the airport (what airline allows ‘fire’ on board? A lantern, or such? You can’t even board with a bottle of mouthwash! )…back in the car…to your house. Then watching a You Tube video of the event made me wonder even more. To me, that is just as much of a miracle as the non-singeing of the Holy Fire itself. I believe what you say, that the Holy Fire is a witness to the miraculous nature of our Faith and how our Faith is spread from person to person, beginning at the very place of it’s birth, Jerusalem. What wondrous things our Lord does as a witness of His presence, even to this day! As an aside….watching that video was an eye-opener. Even though we are all of the same Faith, the cultural difference, the expression of our Faith (I’m referring mostly to the crowds outside the Church), was startling. The closest I’ve seen, and not really very close, was the exuberance of a Pentecostal gathering. Otherwise, by comparison, churches in the west, including us Orthodox are quite “tame”. I noticed the skeptics too. One online “Christian” forum said we’re under the power of Satan. The Satan who causes divisions in the churches, any church, he doesn’t care. So who’s under his power? It’s sad that they can not be enriched by the experience of such miracles. They’re missing out on a lot of Grace. And unity ‘within the same fire of faith’, as you say. That form of communion is precious beyond words. Thank you Father Lawrence. Always more to learn! There are indeed cultural differences among us! I suspect that one reason some of our Orthodox people stumble and disbelieve in the miracle is precisely because of the “rusticity” (let us call it) of some of the enthusiasts. We are so sophisticated, refined, scholarly–none of this simplistic jumping around for us! But whatever the drawbacks of such rusticity (and there are drawbacks), it is through the mass of such rustics through the centuries that the Faith has been preserved. “…none of this simplistic jumping around for us!’ I have to laugh! Recently I heard a podcast on AFR that was interviewing a priest from Uganda. One thing that stuck in my mind was when he said (paraphrasing) “we do things a little different … at times during the service we dance, in a line, up and down the aisles”. That was another good ‘visual’ for me…our African brothers and sisters in a line dance at Church! Oh yeah! Glory to God…every tribe, nation and tongue!! May they never become ‘rustic’! Thank you, Father Lawrence, for these comments about the Holy Fire. I have been hoping someone would begin to talk about its meaning since we received it at our church, Sts. Cyril and Methody in Granite City, Illinois. The analogy with the spread of the Gospel was most striking. I will always carry that image with me and hope it will inspire me to talk more of my faith with other people. Thank you for your kind words. You might be interested in another piece I did on the possible origin/ ratiionale of the Holy Fire (though the embedded link seems no longer to work). 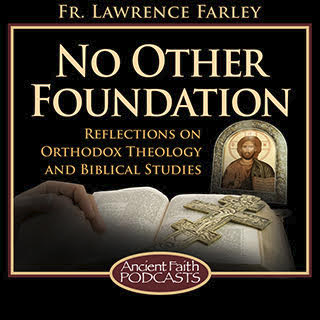 The piece is at: oca.org/reflections/fr.-lawrence-farley/musing-on-the-holy-fire . Why 15 minutes? What happens at minute 15.5? I have no idea why 15 minutes. But eye-witnesses report that after 15 minutes it burns like any other fire. I don’t imagine it was time with a stop-watch; I assume the number is just an estimate. It is an intriguing question.